Q: What is the status of the animation industry in the country? A: For more than 30 years, Philippines has been providing quality animation services to prominent international studios such as Walt Disney and Warner Bros. It has given thousands of jobs to Filipino animators and has contributed an estimated revenue of 153 million US dollars to the Philippine Economy. Q: Why can’t the Philippines develop more shows for local audiences? A: The problem we face is that the animation in the country is not widely known. The general viewing audience is still not aware of how powerful the animation industry is and even more unaware of the potential that it has. 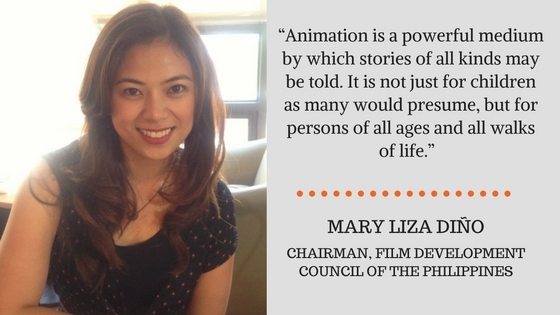 Q: What are the plans of Film Development Council of the Philippines (FDCP) for the animation industry in the country? A: The FDCP is a long time collaborator and supporter of the Animation Council of the Philippines, Inc. (ACPI) and its Animahenasyon Festival. We hope to assist the ACPI in further marketing the Philippine animation industry as a local creative industry which can truly develop itself into a more self-sustaining entity. With the new administration, we commit to further empower this creative industry to reach its global competence. One of our plans is giving “incentives”. FDCP commits to include the animation industry as a key component and key player in the development of the local animation industry in its investment priority plan for 2017. As a creative industry, we will explore possible incentive programs that can be offered to foreign productions. This would give them more reasons to choose Philippines as their outsourcing destination for animation services. Also, it is our thrust to empower and educate audiences all over the Philippines on one of the fastest growing industries - animation. We cannot establish Philippines as a self-sustaining creative industry if the local audience and industry are not ready to accept and take in foreign business such as content creation. Liza Diño was a guest speaker on the first day of the 2016 Philippine Animahenasyon Festival held on November 22-24, 2016 at Samsung Hall, SM Aura, Taguig City.